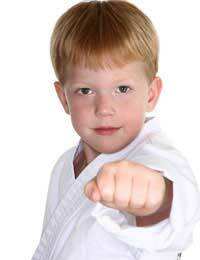 Training in martial arts can be beneficial for children in a number of ways. Not only do kids develop strength and agility but most notice an increase in confidence and self-discipline, as well. "Martial arts" is a broad term, encompassing a variety of fighting and self-defense practices from Asia and while the variations differ greatly, all offer healthful benefits when learned and practiced mindfully. Martial arts practices and disciplines originate from China, Japan, and Korea, with distinct variations for each style. Understanding the basic concepts of each can help parents and kids decide on the most appropriate style based on each child's individual strengths and goals. In general, martial arts training is designed to help participants gain self-discipline, self-control, and self-confidence and while the martial arts are "fighting" sports, training aims to help kids avoid conflict rather than purposefully engaging in aggressive behaviour. Although popular media may make it seem as though martial arts encourages destructive actions, true representations of martial arts are decidedly non-violent. Tae Kwon Do: Meaning "the way of the foot and fist," tae kwon do is considered the most competitive of the martial arts, with impressive displays of high kicks and fancy footwork. Tae kwon do is the national sport of Korea and is the most popular of the martial arts worldwide. Kung fu: Meaning "well done," kung fu actually encompasses many Chinese fighting arts, focusing a great deal on kicks, sharp blows, chops, throws, and leg sweeps. Karate: Meaning "empty hand," karate uses both aggressive and defensive moves, but stresses defensive tactics. Karate utilises throwing, punching and blocking, and weaponry can come into play. Jujitsu: Meaning "compliant art," jujitsu involved considerable sparring and use of weapons. Judo: Meaning "gentle way," judo is often considered a more moderate version of jujitsu, utilising many wrestling type moves. Training focuses a great deal on mental and moral development, and with it's very safe reputation, judo lessons are often quite popular for children. Aikido: Meaning "way of harmony," aikido strives to teach the ability to fend off attacks by turning the tables on an aggressor. Aikido is non-competitive and can be rather spiritual in nature. Some children who would not be comfortable participating in traditional team sports find that they really enjoy martial arts. Many parents prefer that their children avoid some of the fierce competition common in team sports, preferring the lessons that are part of martial arts training, such as discipline and mental focus. Children who are small in stature, shy, or suffer from low self-esteem may benefit greatly from well chosen instruction in martial arts, although these kids are by no means the only ones who find participation in martial arts to be meaningful and rewarding. Martial arts helps to not only develop strong bodies, but to develop strong character, too. As with all lessons designed for children, martial arts instruction should be carefully chosen by parents. A martial arts school should be clean and provide ample space for activity, with all equipment in good condition. Additionally, the attitude of staff members can make all the difference in the world, so interviewing teachers and checking not only their credentials but also seeking the references of previous clients is important. Respectful instruction that stresses self-control and discipline in handling aggression is vital in order to maintain the integrity of the martial arts. When taught by caring, patient, and knowledgeable instructors, students of martial arts may find that the lessons they take away from class help them to manage many areas of their lives with discipline and dignity.